Where does the strength of your farm business or agribusiness lie? Your Capital or Intellectual sagacity? No! 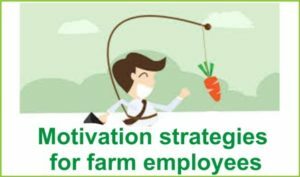 Your motivation strategies for your farm employees is the strength of your farm enterprise. It is very possible you materialize the best feasibility plan but still have a poor yield or complete loss of revenue. It all depends on how you manage your farm workers. The farm business is a unique business unlike other types of businesses, where there is a vertical relationship between the boss and the employees; farm business is not like that. Everyone is the boss in a farm business because everyone plays a significant role in the success of the farm business; everyone has to soil his or her hands. In fact, because you are the boss should make you very humble and treat your farm workers as though they are kings, invariably they are. If your farm employees do not willingly commit extra efforts towards the success of the farm enterprise, then you really need to check your managerial skill. Being a farm worker calls for more attention; truth be told, there is no off-days in a farm business but everyone has to go home at the end of the long day to rest with their families. However, when you motivate your farm workers well, he or she would always put your business, not you, first in his or her priority list. Many farm owners or CEO think the salary or wages they pay is the ultimate form of motivation their farm employees need from them. This is a very wrong assumption. As a matter of fact, if a farm employee works for you based on the magnitude or value of the salary you pay, your farm would fold up in no time. Motivating farm employees is not about the cash but more of the kind. As a one-time farm employee, hoping to be an employer very soon; I have garnered some motivation strategies for farm employees that can be adopted by any farm employers in any form of farm system. This piece is a result of my personal experience with various farm employers and my interaction with various farm employees. Take your time to read up these motivation strategies and adopt them in your practise. How often do you stay with your farm workers on the field and what is your intention for doing so? Most of the farm owners visit their workers on the field to find faults on their assigned task. This is not good enough. You need to create time to stay with your farm employees on the field, not because you want to supervise or to hunt their flaws but because you want them to see the spirit of workmanship in you. They would love it, it would boost their morale and in turn, increase their efficiency. How often do you visit your farm employee family? The incentive does not necessary means money, although it is part of it. Give incentives in cash and kind. Pay courtesy visits to your employee’s homes, relate with their family members, ask about the academic pursuits of their wards, offer a piece of advice and pray with them before living. The positive effects of this emotional incentive are unfathomable. You and I know what it takes to nurse a business right from the mind to its materialization, it is indeed a hard nut you’ve cracked. But remember, it is no longer your business, you have called more hands, in form of employment, to help you materialize your dream. The truth is your employees never wanted you, you called for them and they responded you, hence, you have to respect their courage and sacrifice. Truly you own the business but you earn from their sweat, effort, sacrifice and not your business in the real sense. They are the soul of your business. I hope you know the importance of the soul in your body. Always put yourself in their shoes in any decision you want to make; make their convenience your priority and watch how your business would flourish. At some points in your farm business, you make decisions in accordance with the production function or market information. Make this open. Make suggestions and decide on the next action based on individual contribution. This practice is always absent in a farm system. You all know how boisterous we feel having a large farm. In a farm business, it does not work that way. What have you done today that makes you feel so tired? The bottom line is, do not be harsh with your farm workers. Try as much as possible to be compassionate and not authoritative. It is high time you reshuffled your managerial skill by adopting some of the aforementioned motivation strategies for your farm employees to make the working conditions favorable to your employees.